It is suitable for children 2-10 years old. Younger children will probably benefit from parents or carers learning some of the songs to sign with them. 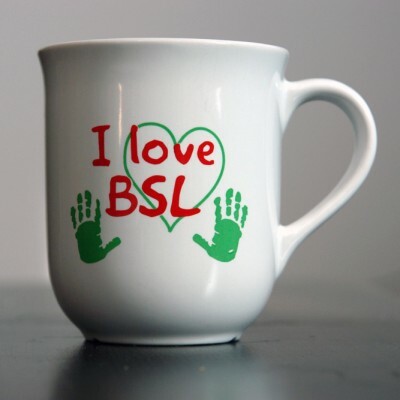 This DVD may also be of interest to older children who are learning or interested in learning sign language, those who work with children in nurseries and schools, or even adult learners of BSL. 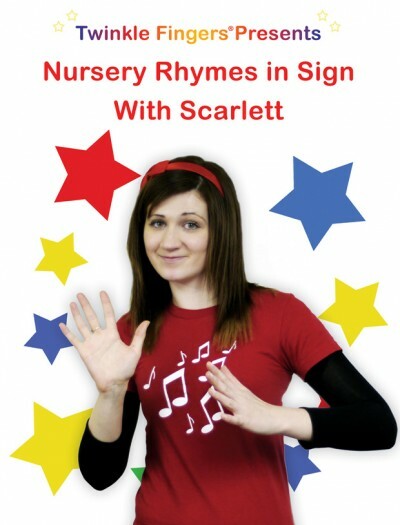 It makes learning fun and the repetition found in children’s songs helps reinforce new signs. This DVD is designed for complete beginners and false beginners. 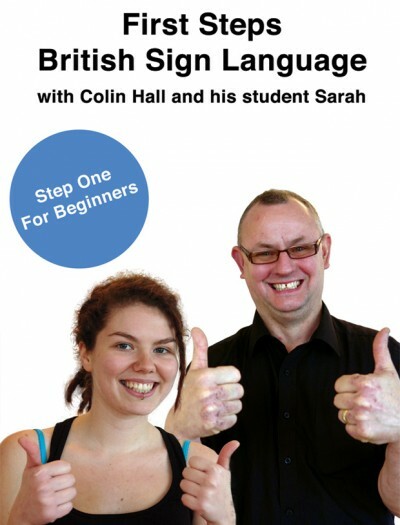 Whether you have recently joined a class, are thinking about doing so, would like to refresh your signing skills or wish to learn independently, this interactive DVD will get you started. Age, time, money, food and drink, clothing, describing people, weather, and transport signs. Each section shows the new vocabulary, followed by a conversation incorporating it and/or someone signing information about themselves using vocab from the section. 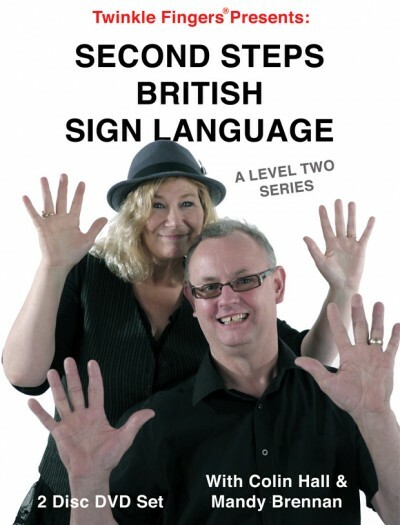 The final DVD in the Level one series, completing all the learning material needed for a good basic knowledge of sign language, enabling the learner to communicate with a native BSL user on a range of simple every day topics such as names, addresses, family, hobbies, the weather etc. This interactive DVD includes signs for days of the week, months and time lines, directions, work, hobbies, things in the home and garden, pets and animals, emotions and feelings. Again, each section shows the signs for the new vocab, followed by a conversation incorporating it and/or someone signing and using the newly taught vocab. At the end of the DVD there are three fingerspelling tests. There are also three short stories using vocabulary learned from Step 1, 2, and 3. 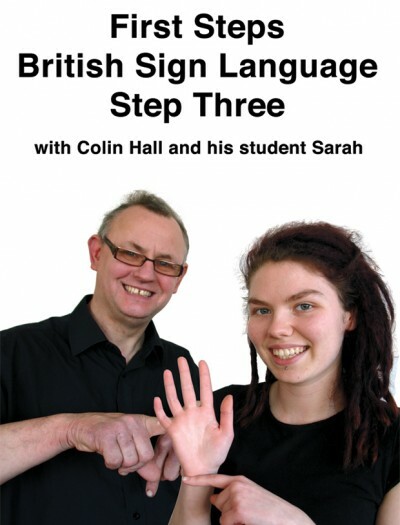 Buy all three First Steps British Sign Language DVDs for the discounted price of £20. 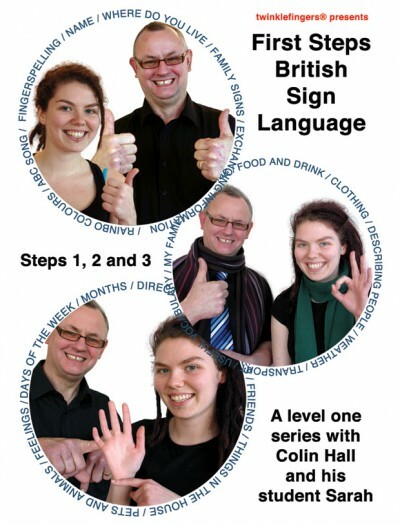 Hello and welcome to this Level Two BSL series, which continues the learning from our very popular Level One series “First Steps British Sign Language”. 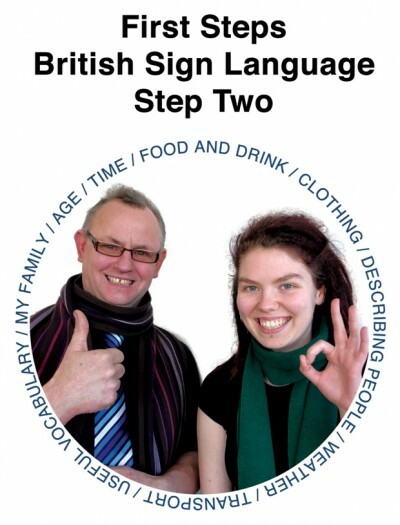 Included in this series, is an explanation of how to use BSL features, such as roleshift, placement, directional verbs, multi-channel signs and so on. You will see many examples of stories and conversations using these features. This series will help you to use these in preparation for your level two assessments. You will learn new vocabulary, extending upon that which was taught at level one. 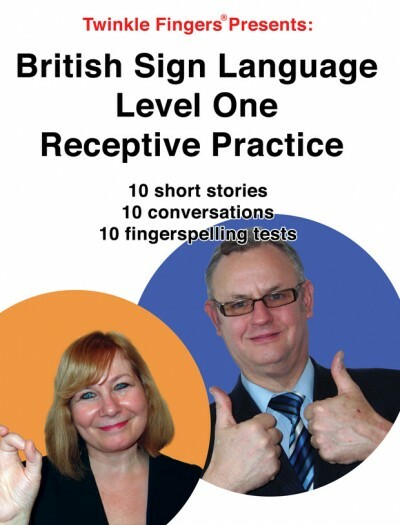 There are several short stories, conversations and fingerspelling tests. To help you prepare for your level two assessments, there are 3 stories with questions, like the ones in the awarding bodyʼs unit 201. There are also three presentations signed according to the requirements of the awarding body, for unit 202, and likewise, three conversations signed according to the requirements for unit 203. This DVD has been produced in response to student feedback, as many feel they lack opportunity for receptive practice. It has been designed with Level two learners in mind. In the Signature level two assessment unit 201, students need to read the fingerspelling of the signer in a video story. Also in assessment unit 203 students need to read the tutor’s fingerspelling in a conversation. The DVD is also suitable for level one improvers and level three beginners. The running time is 2.5 hours. There are 70 tests in total, each test containing 20 words or phrases. Most of the tests are lists of single words, but some have two or more and some are short sentences or proverbial sayings. These will be more challenging and you may have to watch a few times. The fingerspelling is presented with a natural hand position. You will see most of the letters clearly, but some will be more of a challenge, and will require you to work out letters you canʼt quite see using the letters you do know. This DVD has been produced without the face showing and therefore usual clues from lip pattern. 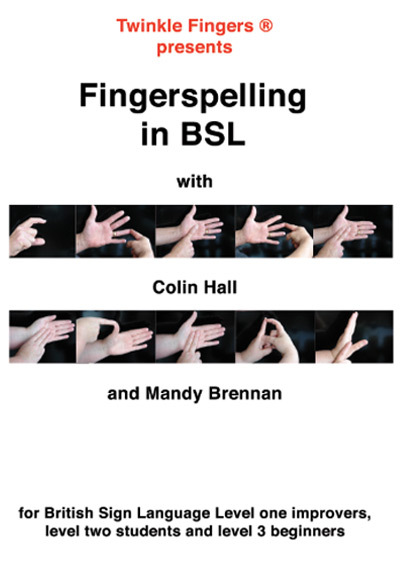 This will improve your fingerspelling skill more rapidly as you won’t be able to lip read. The following video clip is test one, it is quite moderately paced. The fingerspelling gets faster and more difficult as the student progresses on through to test 70. 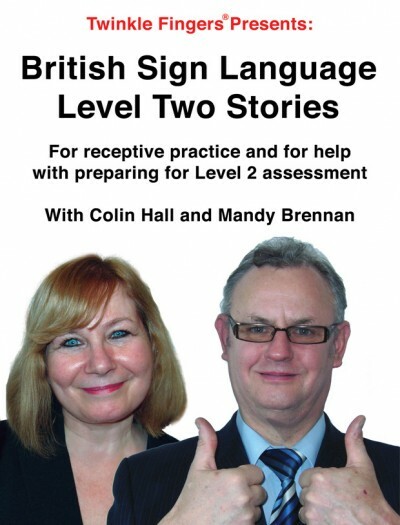 Welcome to this DVD of 20 BSL presentations, each story being 3-5 minutes in length. All include a minimum of 4 fingerspelling, 2 role shifts, placement, referent, directional verbs, multi-channel signs, non manual features, good BSL order, use of space, pace and flow. These are features that students are expected to use in one of the three assessments carried out by the nationally recognised awarding body for sign language qualification at Level two (currently assessment unit 202). By watching you will understand how to use these features well in your own assessment, and further, the DVD will greatly improve your receptive skill. The best way to use is to watch each story through. Try and voice over at the same time. Then go back and watch the same story again, this time pausing throughout to write a transcript. When you have done that, compare what you have written with the English transcript on the DVD. Finally watch the same story a third time, and now look for the BSL features used eg, fingerspelling, roleshift and so on. By doing this you will make the most of this valuable learning resource. Hello and welcome to this level one DVD to help you improve your receptive skill. It will also help you to understand how to get through your level one assessment units, currently called units 102 and 103. This DVD contains 10 fingerspelling tests, each with 10 words (names, cities and countries), 10 short stories and 10 conversations. The conversations are like the ones you will do in your assessments, and use all the features required by the awarding body, and use similar topics. The short stories are played, and then a written English transcript follows. Before watching this transcript, watch each story through and try and voice over what you understand. You may like to also watch again and write down what you see. Then compare your understanding of the story with the transcript. The conversations are played without subtitles in the first instance. Watch these until you have understood as much as you can, and/or write down what you understand. Then compare with the subtitles replays. 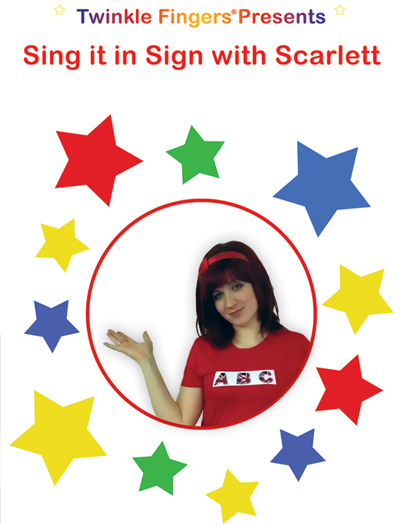 The fingerspelling tests each have 10 words. Pause to write each one down. If you want to fill in any gaps of understanding, go back and watch one more time before looking at the answers which are presented at the end of each test.